And with those familiar opening lines, so begins Jane Austen’s popular and beloved novel, Pride and Prejudice. In Austen’s England, a husband is chosen based on pedigree and wealth, but Elizabeth Bennet has other ideas. She wants a husband she can love and respect, however, upon meeting Mr. Darcy, she is convinced he is the most prideful and smug man in the country, a man she could never marry. Darcy’s pride stings Elizabeth’s quick temper, but through a number of circumstances she begins to realize that pride is a device he uses as befits his station, yet his true character is much more complex and meritorious than she had first realized. After a number of enlightening meetings and finally, when he rescues the reputation of her youngest sister, Elizabeth realizes that love has blossomed among these circumstances and that she has found someone truly her equal in both understanding and temper. 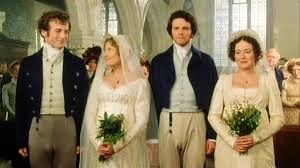 The contrast between the unwise/unhappy marriages of the Bennets, the Collins and the Wickhams are contrasted with the happy marriages of the Darcys and the Bingleys, where mutual respect and independent thought flourishes. Marriage is the main theme and Austen appears to be saying that while prestige and money are beneficial (Darcy has both of these in abundance), the character of a potential spouse is infinitely more important! I have read this book a number of times and love it even more each read. A true classic!